Every single year for as long as I have known Sally, she has planted zucchini. She is typically a very sensible person, but somehow she is unable to remember in May exactly how many zucchini will appear in July. This pasta is her retaliation. 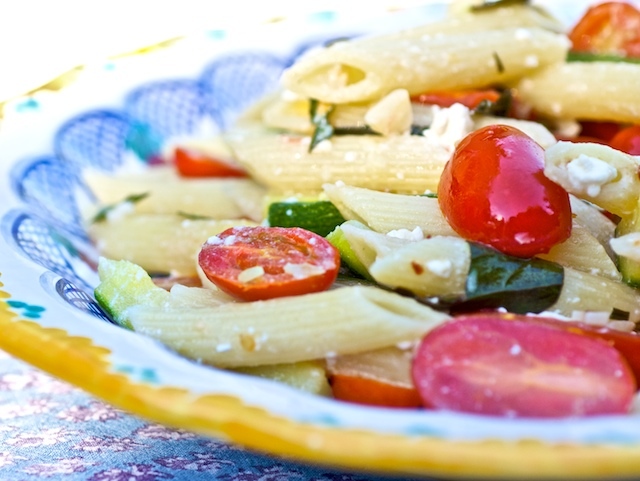 It's cooked in one pot, with mostly raw ingredients, and is perfect on a hot summer night or served at room temperature for a "pasta salad" that even the Italians would approve of. Trim off the ends of the zucchini. Cut the squash into sticks about the size of the penne. Drop the pasta into the boiling water. In the last 3 minutes of boiling (check pasta package for timing), drop the zucchini into the pot. Boil, stirring often, until the penne are tender but still have a little bite. Scoop out 1 cup of the pasta water and reserve it. Immediately drain the pasta and zucchini in a colander. Return the pasta pot to the heat, turning it down to low. Film the bottom of the pot with the olive oil. Add the red-pepper flakes and garlic, and gently sauté just until the garlic is fragrant, 30 seconds to 1 minute. Remove the pot from the heat, and add the drained pasta and zucchini, the tomatoes, feta, basil, and as much of the reserved pasta water as necessary to lightly coat the pasta. Toss gently, taste for seasoning, and serve.